Gorgeous design makes this mailing tool extremely simple to use. Intuitive and logical, with all the detail you need and none of the crowded, annoying distractions you don't. Login and get going. 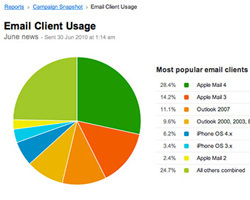 Easy to read reports and charts to track your email response. Pressing 'send' is just the beginning. Our sender reputation is second-to-none. We use fully redundant servers, enterprise class delivery engines and ISP feedback loop integration so that if a subscriber marks you as spam, they are automatically removed from your list. Give your emails the best possible chance of reaching the inbox. Access statistics immediately after sending for deep analysis of what’s working and what’s not. Discover who didn't receive your email and why. Learn what links were popular and who clicked, when and in what program. Take out the guess-work. Easily add your online forms to your website so that each new subscriber is added to your list, automatically. Forget endless copying and pasting. Unsubscribes and bounced emails removed without the need for a human to be involved. Free up your time. Add custom fields (such as 'new client') so you can segment your list any way you like. Make your communications are effective as possible with targeted messages to select groups of people. Quick and easy. See how easy it is add subscribers and send sophisticated email newsletters yourself by adding a simple subscribe button to your website. Click the button for a demo. Let your clients manage their own changes with the ‘Update details’ form. Add it to the end of every email you send. Offer an incentive for people to submit further detail. No more unsubscribes because an email address is inconvenient and no more mindless data entry. Sweet. Help your clients spread your emails far and wide with Facebook 'like', Twitter 'tweet' and 'share with friend' options in your email. Let your clients promote you by making it easy to share. Let us design and deliver an eye catching email campaign for your business. We can take your existing corporate image and build on that to maintain your marketing message or we can start with something completely new. For some information traditional direct mail is still more appropriate. This can be used for a specifically targeted group or locality. 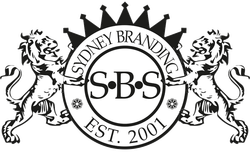 SBS can design and organise a direct mail campaign delivered to any number of addresses anywhere in Australia.